Shinghai, The Pakistani movie, ‘Punjab Nahi Joungi’ of Pakistani actor, Humayun Saeed and actress Mehwish Hayat won the special award in the Shinghai Organization Cooperation film festival. The ceremony of film festival of Shinghai Cooperation Organization (SCO) was conducted in China and this movie was presented there, which has won the special award in the film festival. Humayun Saeed and Mehwish Hayat were present there to receive the award. Mehwish Hayat has shared the pictures receiving the awar on the social media website, instagram and also convey eid mubarak to the fans. She said that she has been in China for last many days and she is thankful to attend the SCO film festival, where her two movies were displayed. Mehwish Hayat said that total 12 movies were presented in the film festival in which ‘Punjab Nahi Joungi’ was also included but her movie has won this award. This festival is proof of the friendship between the two countries and it is honor for the film industry. This award proves that our movies can compete to the movies of other countries. 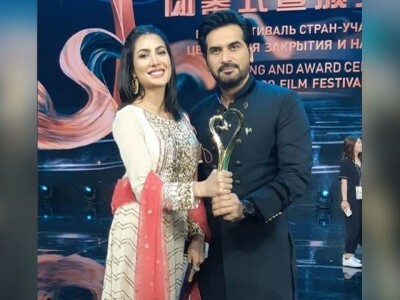 Humayun Saeed also expressed this joy on the receipt of the award and said that he congratulates the team of film on winning the award that this award is the gift for eid and also proud for him.